How do I entertain myself? By either partaking in or watching sport, particularly cycling. Here’s a selection from one of my favourite one-day races, the Clasica San Sebastian, including the race winner Julian Alaphilippe. I’m in heaven for the next two weeks. We’ve rented an apartment with car parking overlooking the main beach in San Sebastian. It’ll be an opportunity to plunder the markets and whip up a few meals, as well as visiting all of our (many) favourite bars and restaurants. Of course, no sooner than we’ve arrived, my beloved will be heading back to London for four days to attend a meeting of research boffins. This is a statement of fact rather than a complaint. I’ll be more than happy pottering around one of my favourite places on my own. I have lots planned, including attending a presentation of La Clasica. This is a race held on the Saturday after the conclusion of the Tour de France and is typically won by a rider exiting the Tour in fine fettle. It’s one of my proud boasts that I’ve ridden the entire route of La Clasica, just not all of it on the same day! If (some of) the boys are lucky, I might just whip up a few batches of cakes for the race finish. Tasty treats are always welcome after many hours in the saddle. 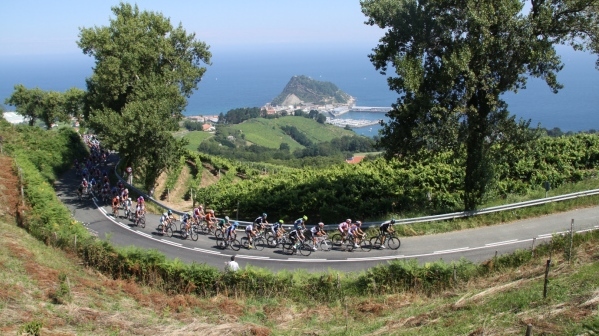 Typically, our trip to the Clasica San Sebastian forms part of a longer trip but occasionally, like this year, we fly down. In the past we’ve flown to Bordeaux and hired a car. This year my beloved decided we would fly to San Sebastian (via Madrid) and stay in the centre, close to all the action. He booked the flight back in March and gave me the confirmations which I filed in chronological order in my big fat holiday file. On the Sunday before we were due to depart for our five-day trip to San Sebastian, I took out the confirmation of our flight booking to check the luggage allowance. When I entered my name plus the booking reference into the Iberia site, it advised me that no such reference existed on the system. Alarm bells started to ring. My beloved undertook a mercy dash to the airport to resolve the issue – several months in the dog house and complete removal of privileges at stake. He returned with a contact number and was put through immediately to an extremely helpful gentleman who obviously didn’t work in their call centre. It appears that the bank rejected the payment despite more than adequate funds and my beloved correctly inputting the magic bank code he received on his mobile. We can only conclude that because he booked and paid for another Iberia flight, the bank willfully decided to reject one of them. We were blissfully unaware because we had a flight confirmation number. Fortunately, the man from Iberia was able to restore our booking – phew! I had booked a room in a recently opened 10-bedroomed pension a few steps from the beach and the Old Town which was an ideal location and, thanks to triple glazed windows, blissfully quiet. It had everything you need in a hotel bedroom, nothing you didn’t, and all at a great price. I’ve already booked it again for next year’s race and given it a glowing endorsement on Booking.com. 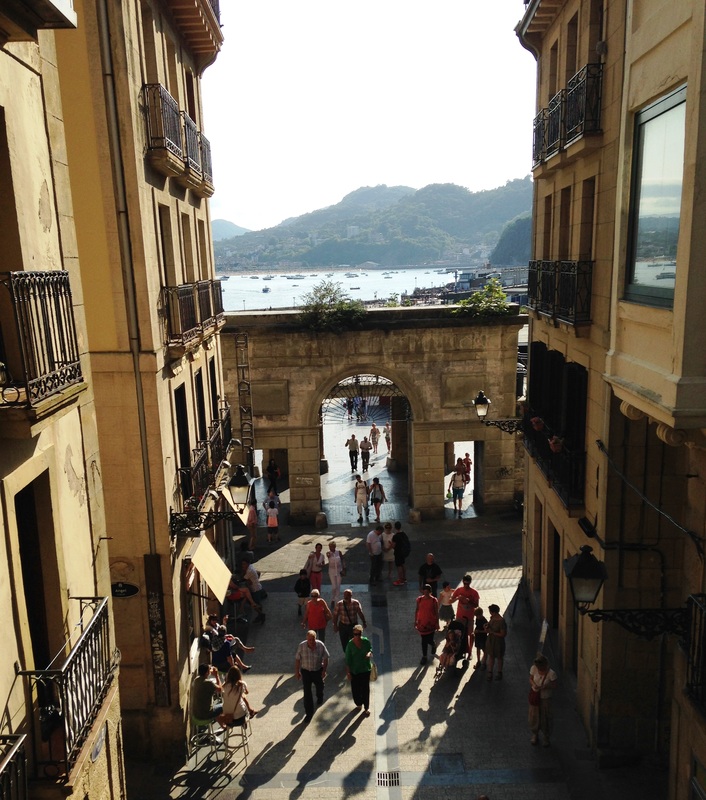 Apart from watching the race, our intention was to further explore San Sebastian. Even though we’ve been here a number of times, we’ve not seen everything or even eaten in all of its wonderful bars and restaurants. Our days were spent walking along the beach and around the town, visiting its monuments, watching the race, sampling some old favourites and some new restaurants and pintxos (tapas) bars. The hotel had an arrangement with an excellent nearby neighbourhood bar for breakfast, that also served some fabulous pintxos and local specialities, before deciding how to spend our day. The weather was better either side of the week-end and I like nothing better than strolling along the La Concha beach with my tootsies in the wet sand. The beach tends to be more crowded closer to San Sebastian’s Alderdi-Eder Park but there’s plenty of room further along or you can enjoy the extension of La Concha, in Ondarreta. Alternatively, if you like surfing, head to the beach the other side of the Urunea river, the Zurriola. So that’s three beaches to bronze on, swim, build sand castles, or whatever takes your fancy. One morning we walked the full length of two of the beaches to enjoy the civic sculptures at either end: Construccion Vacia by Jorge Oteiza and Peine del Viento by Chillida and Pena Ganachegui. Of course, had we been so inclined,we could have hired bikes and cycled on San Sebastian’s many bidegorris (bike lanes). We also walked up and along two of the town’s three hills: the Igueldo overlooking Ondarreta beach and Urgull overlooking the fishing port. Saturday was spent watching the Clasica, one of my favourite one-day races which we first saw live back in 2011. While the organisation of the race and indeed the route is much improved, much stays the same including the enthusiasm of the fans. Many ex and current professional riders also come en famille to see the race. It’s just that kind of event. We spotted a number of teams the day before riding around and soaking up the sights and sounds. It’s a popular post-Tour race and generally won by a rider who’s shown good form in the Tour. Sunday we’d set aside to explore the San Telmo Museum which includes a beautiful 16th century Dominican convent, decorated with canvasses illustrating the most important events in Basque history, among its many exhibition spaces. Aside from its temporary exhibitions, the museum presents an attractive journey to the very heart of Basque society from its origins to present day. The entrance fee is only Euros 6 and you get a Euro 2 reduction on a drink and a pintxos in the attached café San Telmo which has an excellent restaurant. I speak from experience. Talking of restaurants, we’d booked to visit an old favourite Gandarias, in the Old Town, which also has an adjoining pintxos bar but sadly Kokotxa was fully booked for lunch and dinner – next time. On previous trips we’ve eaten at some of the many Michelin starred establishments but we’ve never eaten badly anywhere in the Basque country. Just follow your eyes and nose and you won’t go wrong. We also had a wander around the town’s two markets in La Brexia and San Martin. Given half a chance I’d have brought back lots of Basque goodies but there was only so much space in my luggage. And while we’re on the subject of luggage, mine is currently still unaccounted for. My beloved’s turned up the following day but they’ve yet to establish the whereabouts of mine. I can only conclude it’s ticking off a few places on its bucket list. Meanwhile, I’m holding onto the thought that airlines rarely lose baggage, just misplace it for a while. But, just in case, I’ve already prepared a detailed list of its contents and their value. Friday postscript: According to Iberia’s missing luggage tracker, they have tracked down a Tumi they think might be my missing bag. Monday postscript: My bag’s back, no idea where it’s been, but am very grateful for its return. Another trip? I know. We’d only just gotten back from the Tour. Typically, we’d have gone directly from the Pyrenees to northern Spain for a further week’s vacation. But, as we’re taking quite a bit of time off in September for the World Champs, we came back home. With hindsight possibly not the best decision. I’ll explain why. Last Monday I popped out to the supermarket to stock up on essential supplies. As I was leaving the car park, a car reversed straight into my beloved Tom IV. I was too shocked to even honk my horn. It all happened so quickly. The car, a swanky BMW driven by a Frenchman in his 50s, just shot straight out and hit Tom. After stopping, counting to ten, taking a deep breath and getting out of my SMART, I enquired, somewhat sarcastically, whether his mirrors had steamed up! But was rather taken aback when he freely admitted he never looks in his mirror (evidently) instead he relies on his obviously fallible reversing warning system. I pointed out that I could have been an old(er) lady or even a child. He had the grace to look chastened and asked if we could settle the matter privately. I sympathised. Car insurance is expensive in France and it’s equally hard to maintain the maximum 50% “no claims” bonus. Also, the damage to his car was more extensive than the scratches inflicted on Tom IV’s paintwork which are being repaired next week at his local garage, at his expense – sorted. Tuesday I ventured out to drop some papers off at the accountants before their summer vacation. When I returned to my car, someone, quite probably a white van man, had reversed into it and bust the lights on my bike carrier, which was now hanging on by a thread. Realising that maybe it wasn’t my week, I stayed home Wednesday! Recently that’s not been my only challenge. I’ve been trying to bank a cheque made payable to me – to be split with my two sisters – as trustee, of part of my late father’s estate. Thanks to increasing money laundering regulations I’ve had no luck whatsoever and been made to feel like the sender of one of those spam emails from someone in Nigeria. Perhaps they could tell me what to do? So it was with some relief I packed up my kit bag and headed to San Sebastian last Friday to enjoy one of my favourite races, in one of my favourite places. We stayed in the Txacoli producing area of Getaria, just up the coast road from San Sebastian, in a delightful casa rural owned by a winery. View from my bedroom window: vines and the sea! To be honest, any establishment that serves creme caramel and cheesecake for breakfast gets my vote. Apple pie, cheesecake, flan, chocolate cake, tortilla………..
As usual the trip was punctuated with catching up with a number of cycling friends over a glass of wine and tapas, or pintxos as they’re called in the Basque country. Just like at the earlier Tour of the Basque country, it seemed odd to be there without the Euskaltel team though there were a number of its former riders plying their trade (thankfully) with other teams. The sun shone, the crowds were plentiful and a Spaniard won the race. I even sat on the beach for an hour or two! Now I’m back home with my nose firmly to the grindstone for several weeks until we leave for that extended trip to the World Road Race Championships in Ponferrada. We’ve been back in my beloved Basque country for a vacation with our bikes and while we were there we watched a couple of bike races too. 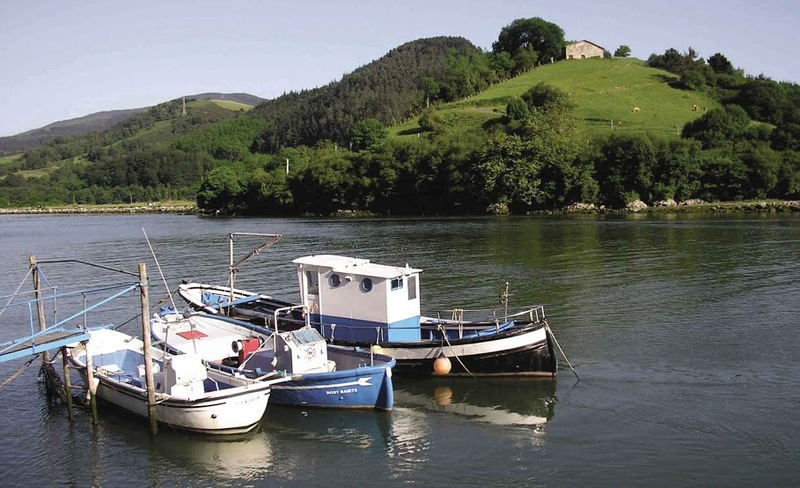 On the recommendation of friends who know the area well, we stayed in a delightful Casa Rural – bed & breakfast – just down the coast from San Sebastian. The place was charming with lots of lovely home-from-home touches and a very welcoming hostess. Our days followed a very similar routine. We were woken by birdsong and the cockerel up the road, ate a hearty breakfast and then headed out on our bikes. There’s very little flat in the Basque country, so whichever direction you decide to ride you’ll soon be reaching for the little ring. I find I give a good work out to 34 x 27 (uphill) and 50 x 13 (downhill) and largely ignore the gears in between. The week started off positively sultry with us both working up a good sweat even before we reached the first incline. Although we set off together, I’m soon distanced and soldier on behind admiring the lush landscape, flora, fauna and the lovely stone farmhouses. I find it helps take my mind off those sudden steep inclines that pepper the countryside. I just slo-mo up them, dancing on the peddles and fix my gaze on the next challenge. One of the many delights of riding in the Basque country is the other road users. There are always plenty of cyclists who give me much encouragement as they zoom past me on the uphill sections only for me to return the favour on the descents. Vehicles are happy to patiently wait before overtaking, they don’t rev their engines or honk their horns or accelerate past you on blind bends. But then you’ve got to figure that they’re all cyclists too. Ride over we discover we’ve built a ravenous hunger which can only be extinguished by lunch. In this area it’s typically three courses, wine, water and coffee for anywhere between 9-13 Euros a head. We’ve made some startling discoveries. Two of the local bars serve what I’ve always regarded as British specialities, but maybe they were Basque inventions: the chip butty and the bacon sarnie! We also tried a couple of Asador’s, essentially BBQ restaurants and possibly another Basque invention? At lunch one day we were served a pink Txakoli, the local petillant wine and after much searching we managed to find the only vineyard that produces it in Getaria. It was perched high above the town affording great views of the coastline and the grapes are allegedly bathed in sea mists which accounts for its delicious taste. I’ve bought a dozen so it’s going to be my drink of the summer. Much as I love vacations with my beloved, and our bikes, they do throw up some challenges. Suddenly we’re having to share a bathroom while at home we have his and her’s facilities at opposite ends of the flat. We also have to share a bed and a bedroom for longer than a couple of nights. I generally request twin beds so that I don’t get woken by his incessant tossing, turning and throwing off of the bed sheets. I like to sleep with the window open but am mindful of the mosquitos. It was quite humid at home before we came away and the wee beasties had been treating me as some sort of monster mozzie munchie, despite the liberal application of repellent. On the advice of the pharmacist I’ve been wearing a mosquito repellant bracelet. It’s supposed to work for a month and was fine for four days but now seems to have lost its magic charms. Of course, holidays with my beloved also give rise to some interesting incidents, usually involving the loss of something, generally keys. This time it was his driving glasses. However, most unusually he remembered where he’d left them some four hours earlier. We returned to the scene and he managed to recover them, slightly the worse for wear, but now repaired by an optician. We had thought we might spend afternoons quietly on the beach but instead preferred to walk along the sandy shorelines cooling our feet in the water before ambling round old towns we’d yet to explore. Although Spain’s economic decline is severe, it’s less evident in the relative wealthy north, where unemployment is half the national average. 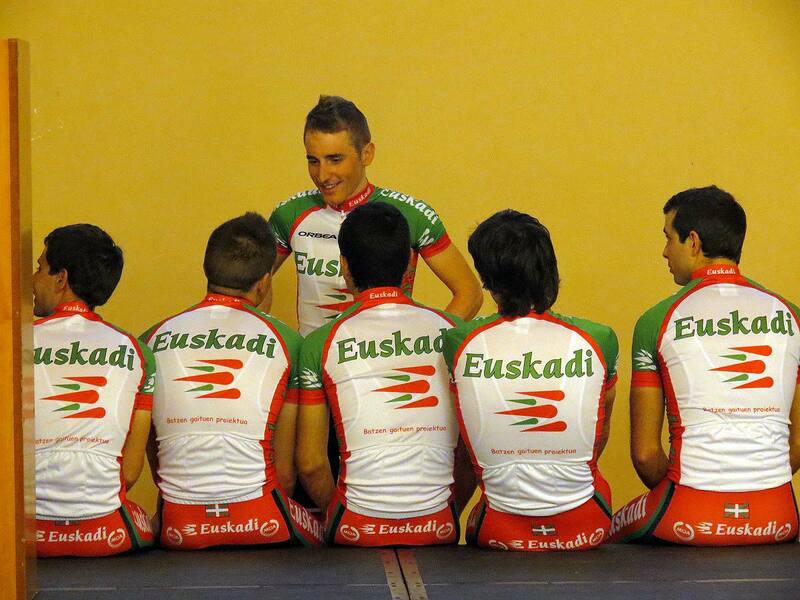 However, one senses that it’s only going to get worse following news that the local ProTour team Euskaltel-Euskadi has been unable to secure funding to continue. Local sports teams have heavily relied on local authorities for funding, that’s all coming to an end and with it the hopes and dreams of many a young athlete. The town where we were staying had one of the leading rowing teams which race against one another from May to September all along the coast in wide flat boats. The races are televised and enjoy much local support and sponsorship, the ladies race too. This is definitely the sport for those that weigh more than 70kg. We were also transfixed to the big screen one lunch-time – a large flat screen or two is de rigueur in all bars and restaurants – watching a scything competition. Basically, how much grass can you scythe in an hour? I kid you not? The scythers bring their coach, team helpers and scythe sharpener who sharpens the one scythe while the scyther is clearing swathes of dense grass land with the other The scythed grass is weighed and the winner was a chap called Igor, I forgot his last name but suffice to say it used up all the available Ks and Zs from a scrabble board. Amazingly, there were even crowds of supporters. I later discovered this is also a popular “sport” in the West Country but frankly it was no contest. The Basques dressed in running shorts and sleeveless t-shirts with bare feet looked much more like finely tuned athletes. I have to confess I was somewhat concerned at the amount of bare flesh exposed given the flashing scythes but these boys evidently know what they’re doing and frankly how else are you going to cut the grass on those steep Basque climbs?